Status Interceptor sites deployed to Fort Greely, Alaska and Vandenburg Air Force Base, California. Currently there are 44 interceptors deployed. 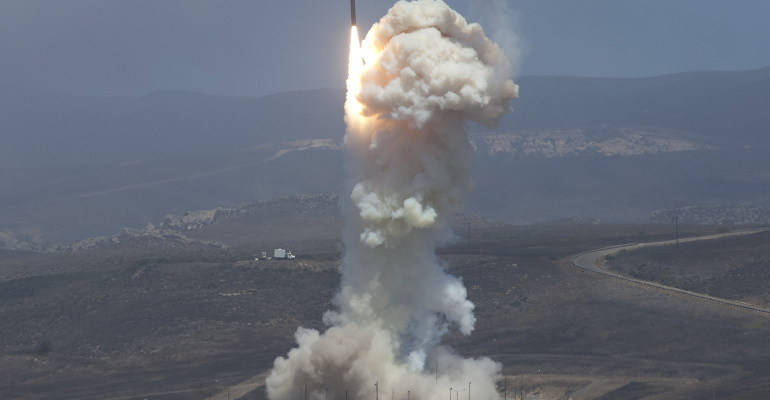 Homeland Defense GMD is currently the only system the U.S. deploys capable of protecting the homeland from intercontinental ballistic missile (ICBM) threats. GMD is designed to defend against limited ICBM threats from rogue nations such as North Korea and Iran, and is not designed to counter the strategic forces of nations that possess advanced ICBM capabilities such as Russia and China. In addition to early warning radars, early homeland missile defense plans also called for cooperation with European allies on the deployment of elements of the GMD system. In response to the development of the Iranian ballistic missile threat, President George W. Bush formally entered into negotiations with the governments of Poland and the Czech Republic in 2007 to host elements of the GMD system in their countries that would defend against intermediate to long range ballistic missiles originating from Iran. President Bush’s plan called for up to 10 two-stage GBIs in Poland and an X-Band Radar in the Czech Republic. However, upon entering the White House in 2009, President Barack Obama cancelled the Bush Proposal and announced the European Phased Adaptive Approach (EPAA) in its place on September 17, 2009. While EPAA provides reliable theater defense against ballistic missiles up to the intermediate range, the plan lacks the homeland defense element of the Bush administration proposal. Deployment As of November 2018, there are a total of 44 GBI interceptors deployed to protect the homeland. This includes 40 GBIs in Fort Greely, Alaska and 4 deployed to Vandenberg Air Force Base, California. President Trump has requested funding for 20 additional GBI interceptors to be deployed in the United States. Modernization Two key programs will contribute to the modernization of the GMD System, the Long Range Discrimination Radar (LRDR) and a next generation kill vehicle, the Redesigned Kill Vehicle (RKV). The LRDR, scheduled to begin defensive operations in 2020, will serve as a midcourse sensor to improve target discrimination capability for the BMDS to better address potential countermeasures and increase the capacity of the GBIs in Alaska and California. The RKV, scheduled for initial deployment in 2020, will incorporate performance enhancements in target acquisition,discrimination, and survivability. The RKV will also feature on-demand communications that enable better use of off-board sensor data and provide improved situational awareness for the warfighter. The first flight test of the RKV is planned for 2018, and the first intercept test is planned for 2019. Together, these enhancements will allow the system to lower the “shot doctrine”, or the number of interceptors needed to successfully destroy an incoming warhead. North Korea is currently developing an increasingly sophisticated nuclear and ballistic missile capability. In December 2012 and February 2016, North Korea successfully placed satellite payloads into orbit via a long range rocket, the Unha-3, which Pyongyang maintains is intended only as a space launch vehicle (SLV). However, developing a SLV contributes heavily to North Korea’s long-range ballistic missile development, since the two vehicles have many shared technologies. In a 2012 military parade, the DPRK unveiled a new road-mobile ICBM, the KN-08. While the KN-08 has not yet been flight tested, the Department of Defense assesses that North Korea currently possesses at least 6 launchers for the ICBM. With a range of over 3400 miles, these long- range missiles have the ability to reach a number of targets within the U.S. homeland. Iran has also carried out four satellite launches, with the most recent occurring in April of 2016. The GMD system is capable of defending the entire United States from current long-range threats originating from North Korea. Modernization efforts for the GMD will ensure that the system stays ahead of the developing North Korean threat. January 17, 2019: 2019 MDR notes the potential for an additional GBI site located in the Continental United States when the Iranian nuclear ICBM threat materializes to be a valid threat to the United States. November 2, 2017: MDA in cooperation with Boeing Corporation installed the 44th interceptor in its silo at the Missile Defense Complex at Fort Greely, Alaska. May 30, 2017: MDA in cooperation with the U.S. Air Force successfully intercepted an intercontinental ballistic missile target for the first time using GMD. This was the first live-fire test against an ICBM target, and GMD was provided target acquisition and tracking data by the Command, Control, Battle Management and Communication (C2BMC) system. The Sea-Based X-band radar, positioned in the Pacific Ocean, acquired and tracked the target. Using this tracking data, and data provided via C2BMC, GMD developed a fire control solution, enabling the successful intercept using a Ground-Based Interceptor. July 2016: MDA Opens Missile Defense System Data Terminal at Fort Drum, New York for the In-Flight Interceptor Communications System (IFICS) data terminal. The data terminal is designed to send and receive messages to the Exo-atmospheric Kill Vehicle (EKV) while in flight, constantly transmitting target updates. The data terminal also relays data from the EKV back to the GMD fire control system. Five other such terminals are currently in operation at Fort Greely, Alaska; Shemya, Alaska; and Vandenberg Air Force Base, California. January 2016: MDA, in cooperation with the U.S. Air Force 30th Space Wing, the Joint Functional Component Command for Integrated Missile Defense, and U.S. Northern Command, successfully conducted a non-intercept flight test of the Ground-based Midcourse Defense. June 2014: MDA successfully conducted a test in which a long-range ground-based interceptor launched from Vandenberg Air Force Base, California, intercepted a threat-representative, intermediate-range ballistic missile target launched from the U.S. Army’s Reagan Test Site on Kwajalein Atoll in the Republic of the Marshall Islands. July 2013: MDA, U.S. Air Force 30th Space Wing, Joint Functional Component Command, Integrated Missile Defense (JFCC IMD) and U.S. Northern Command conducted an integrated exercise and flight test of the Ground-based Midcourse Defense system. Although a primary objective was the intercept of a long-range ballistic missile target, an intercept was not achieved. March 2013: Secretary of Defense Chuck Hagel announced a plan to deploy an additional 14 GBIs to Alaska following North Korean provocations. December 2010: MDA was unable to achieve a planned intercept of a ballistic missile target during a test over the Pacific Ocean. The Sea Based X-Band radar (SBX) and all sensors performed as planned. The Ground Based Interceptor (GBI) was launched and successfully deployed an Exoatmospheric Kill Vehicle (EKV). January 2010: MDA conducted a flight test of the Ground-based Midcourse Defense System which failed to intercept its target. December 2008: MDA successfully completed an exercise and flight test involving a successful intercept by a ground-based interceptor missile. For this exercise, a threat-representative target missile was launched from Kodiak, Alaska at 3:04pm (EST). This long-range ballistic target was tracked by several land- and sea-based radars, which sent targeting information to the interceptor missile. May 2008: The Multiple Kill Vehicle (MKV) program successfully demonstrated the engagement management algorithms for the Multiple Kill Vehicle-L carrier vehicle during a modeling and simulation exercise. September 2007: MDA successfully completed an exercise and flight test involving a successful intercept by a ground-based interceptor demonstrating the ability of the Upgraded Early Warning Radar to acquire, track and report on objects. The test also evaluated the performance of the interceptor missile’s rocket motor system and exoatmospheric kill vehicle. February 2005: MDA was unable to complete a planned flight test after the interceptor missile did not launch from the Ronald Reagan Test Site, Republic of the Marshall Islands, in the central Pacific Ocean. December 2004: The Missile Defense Agency (MDA) was unable to complete a planned flight test after the interceptor missile experienced an anomaly shortly before it was to be launched from the Ronald Reagan Test Site, Republic of the Marshall Islands, in the central Pacific Ocean. July 2004: Missile Defense Agency Emplaces First Interceptor at Fort Greely, Alaska.